Nicole---What a great, fresh idea!One of my favorite ways to eat strawberries is just as you've so beautifully shown them here. Sometimes when we've just returned from the produce market, I'll stand at the sink and take ripe strawberries one by one, pinching them by their green tops, rinsing them under the tap and devouring them on the spot.I did, however, recently make a spicy mango/strawberry salsa that I served with salmon. I'll email you the link. hi nicole! it's great to see you hosting your own event! i have been in non-stop berry consumption this spring. for the past three or so months it's been a breakfast of fresh carlsbad berries and yogurt. sooooo good! i can't wait to see all the photos. 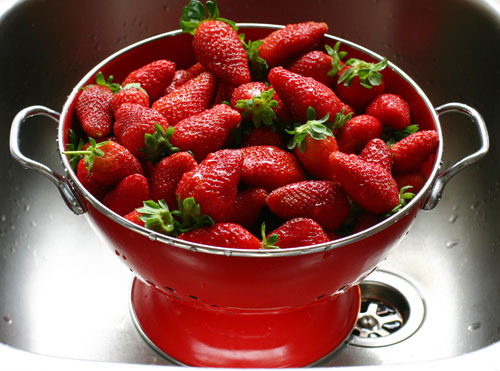 You have inspired me to buy a bunch of strawberries and eat them one by one, my body half dangling over the kitchen sink to catch the juices that inevitably spill from my mouth.That picture is delicious! I think my boyfriend and I have eaten 10 pounds of organic strawberries from Whole Foods in the last two weeks. It's so amazing how fresh and sweet berries are at this time of the year. Almost better than candy. Can't wait to see some great recipe ideas! Amanda: Your comment got caught up in my spam filter and I just rescued it! Mmmmm...berries for breakfast! I had some strawberry granita for breakfast yesterday :-)C(h)ristine: Mmmmm...hope you enjoy them!Deborah: Yes, me too!Erin: Sounds good :-)Astrid: Thanks! Looks like some great stuff there! Hey! Do you know if they make any plugins to safeguard against hackers?I'm kinda paranoid about losing everything I've worked hard on.Any recommendations?